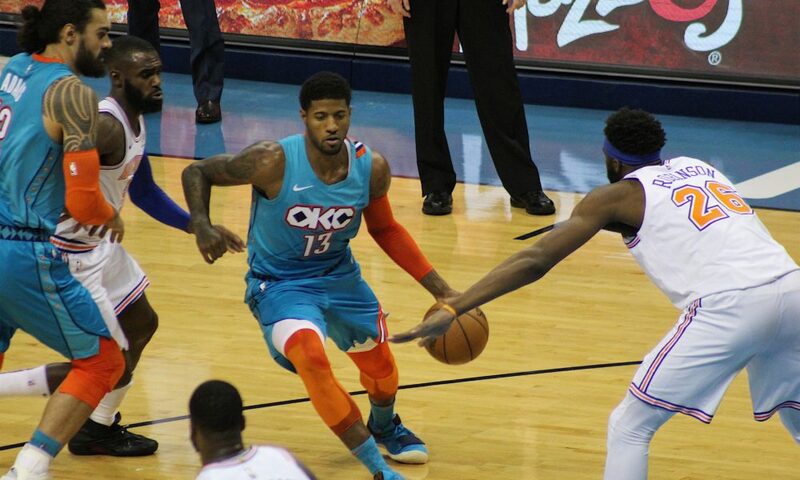 A massive night from Paul George, strong Thunder defense, and poor shooting on the Knicks end led to the Thunder picking up their ninth win in the past ten games as they defeated the New York Knicks 128-103 in Oklahoma City. The Thunder started off hot outscoring the Knicks 37-22 in the first quarter, and they never lost the lead as the game continued. The Thunder offense finished 53.7 percent from the field, 48.5 percent from beyond the arc, and five players finishing in double digits. Paul George had a season-high 35 points, 7 rebounds and 5 assists shooting 5-11 from 3 and 13-22 from the field. His big moment came in the third quarter where he picked up 17 points; this being the most a Thunder player has had in a single quarter this season. Russell Westbrook was out for the fifth straight game as he continues to recover from an ankle sprain, but the Thunder held up well without their star, and players like Dennis Schröder, Steven Adams, and Jerami Grant contributed heavily on both the offensive and defensive side of the ball. Former Thunder, Enes Kanter, received a standing ovation from Thunder fans as he entered the game for the Knicks late in the first quarter, and he finished with 19 points going 8-11 from the field, 1-1 from downtown and gave Thunder fans a show as he went up against his good friend, Steven Adams. The New York Knicks will fall to 4-11 in the season, 2-6 on the road, while the Thunder improve to 9-5 in the season, 6-2 at home, and the Thunder will go on a three-game road stretch making stops in Phoenix to face the Suns for the third time this season on Saturday night before taking on the Kings in Sacramento on Monday. They’ll battle the Golden State Warriors in Oakland for the second time this season the day before Thanksgiving, and the Thunder will return to Chesapeake Energy Arena to host the Charlotte Hornets on Friday the 23rd. Watch below for Thunder locker room reactions from Paul George, Steven Adams, Dennis Schröder, and Terrance Ferguson following tonight’s win over the Knicks.